A lovely sunset view from the top of my building. I wish I had been here for the 4th of July. It is really spectacular up here. 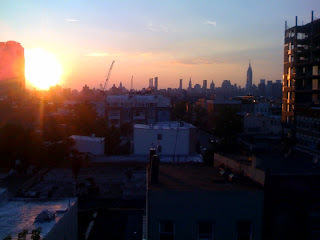 I've been in my Williamsburg flat for almost four days now and starting to feel like a real New Yorker. Been hanging out locally and downtown with friends. We went to see Martin Gore (Depeche Mode) spin on Thursday night and yesterday I took the train to Long Island to attend the Warped Tour to see lots of old friends. Today I was hoping to catch a free show at McCarren Park Pool but it's storming so I'm curled up on the couch studying Herbology. It's actually really romantic. I feel like the ultimate bohemian chick out here. I start working at Bonobo's tomorrow. I'm not excited to be wearing a uniform (t-shirt and cap) but excited about experiencing something new. We'll see how it goes.